Android 6.0 Marshmallow is the sixth version of the android operating system. This android was launched in October 2015 and it is a refinement and extension of the core features and functionality of Android Lollipop. After Donut, Jellybean, and KitKat, this Marshmallow android primarily focus on improving the overall user experience of previous Lollipop. After Android 6.0 Marshmallow, then there is a new version of it called Android 6.0.1 Marshmallow. After appearance of Android 6.0.1, then people wonder how to root this android. 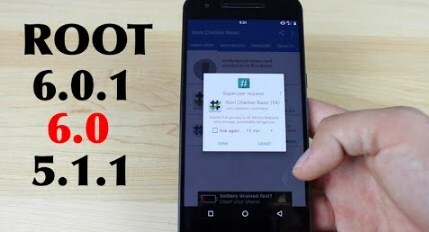 You may be one of people who use Android 6.0.1 who also want to know how to root your android. Basically, the steps to root is the same. But, we need to know which root app that can be used to root android 6.0.1. Kingo Root is one of the root applications that can be used to root android 6.0/ 6.0.1 Marshmallow. How to root this android? Before explaining about that, it is better for you to know what rooting is. Root is able to access all files of your android mobile and then you will be able to get instant access to the root directory of your android mobile. It means that you are also able to access all files which contain your Hardware info. You are able to root your android 6.0.1 by using Kingo Root through 2 methods including using Kingo Root apk or using PC. But here, we are going to explain how to root your android tablet 6.0.1 Marshmallow by using PC. To root using PC, there are several things that you need to prepare including Internet connection, USB cable and it is recommended to use the original one and also the device which is powered ON and 50% battery level. If you have prepared these, follow the steps below to root your android tablet 6.0.1 Marshmallow. First, you have to download and install Kingo Root on Windows (PC version). After the download and install process is complete, double click the desktop icon of Kingo Root and then launch it. Then, you need to connect your device to computer and enable USB debugging mode. If your device USB is not installed on your PC, Kingo Root will install it automatically for you. Now, you have to click on “ROOT”. Before you click on “Root”, it is important to know that Kingo Root will employ multiple exploits on your device and it will probably take a few minutes. In the process of rooting, your device may be rebooted several times. When it happens, do not be worried because it is normal. If the process is done, you will get a message which states that Root is succeeded. Until your device reboots itself, make sure that you do not operate it. If the root process is complete, you are able to do anything with your device. You can flash a custom ROM, customize the UI or even uninstall the bloatware after you root your android and you will be easy to do that. Related Post "How to Root Android Tablet Marshmallow 6.0.1"